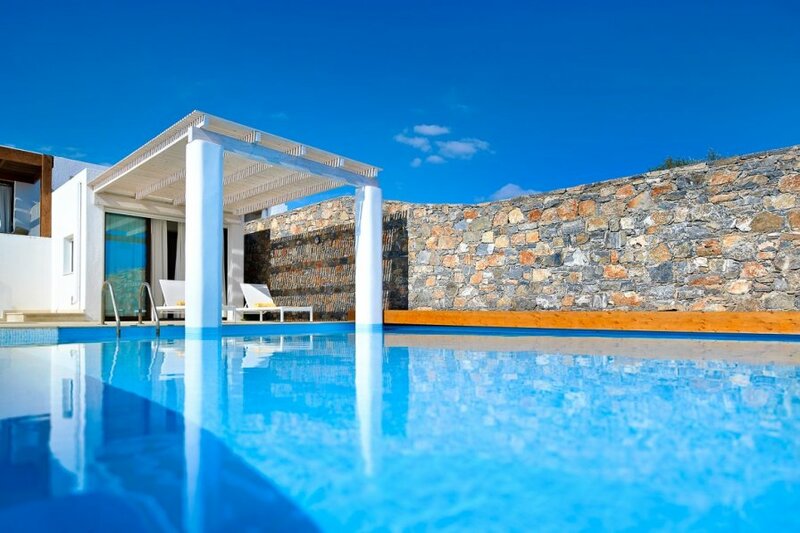 Villa Helen is a luxury three-bedroom villa in sun-kissed Crete, Greece. This modern. Enclosed with a rustic stone wall and costal facing, this villa is both private and serene. Stepping through the glass doors outside, you're greeted by the pool area and sun terrace with plenty of places for you to relax in the sun or the shade. Take a cooling dip in the crystal waters, delve into a good book on one of the sun loungers or enjoy dining al fresco on the veranda with BBQ facilities and a dining table and chairs overlooking the coastline. The villa is decorated contemporary in style with light white-washed walls and modern furnishings. Sleeping up to five guests and one baby, there's a master bedroom with spectacular sea views, two twin rooms and a single room – all with comfortable beds and plenty of wardrobe space. There's also a fully-equipped kitchen and an open-plan lounge area with a TV and DVD and CD player. Plus, let's not forget the air conditioning, Wi-Fi and towels, slippers and bathrobes provided. As part of a wider complex, during your stay at Villa Helen, you have access to the complex's top-notch facilities. You can unwind in the spa and have a massage or head to one of the restaurants and bars for a drink and a bite to eat. With a maid service and option to order breakfast in, Villa Helen has thought of everything for a stress-free stay in an idyllic sun-kissed Mediterranean location. Located east of Crete's capital Heraklion and north of the town Lerapetra is the charming town of Agios Nikolaos. It's famous for its beautiful sandy beaches, picturesque waterfronts and welcoming atmosphere. Perfect for a variety of ages and families, friends and couples alike, there are many things for you see and do here. For lazy afternoons spent by the sea, sandy Kitroplatia Beach is a perfect choice. This popular stretch of coastline has clear waters and is ideal for children and anyone looking for a beautiful and clean beach, close to all amenities of the town. There's also Almyros Beach – a large sandy stretch set in a sheltered cove, and the water is shallow so children can swim here safely. From Agios Nikolas, you are well placed to discover island's capital Heraklion and immerse yourself in ancient culture. The vibrant port city is best known for the Palace of Knossos. The archaeological site dates back thousands of years to the Minoan civilisation. Guarding the city's Venetian port is the 16th-century Koules fortress. A drive around Heraklion will also bring you to traditional villages, Medieval castles, Byzantine monasteries and secluded coves.